Click on the Packages drop down in the main menu bar and select New Package. 2. A pop window will open where you can name your Package (Description) and you are able to select what type of Package you are creating. Select Casting if you want a headshots package (that link to the talent's page on your site) and select Gallery if you would like to choose which images you send to your client. 3. The pop up also allows you to add a Client from the drop down or to create a new Client (please remember that if you create a new Client there will be no details associated until you add them in the Client Contact list). 4. 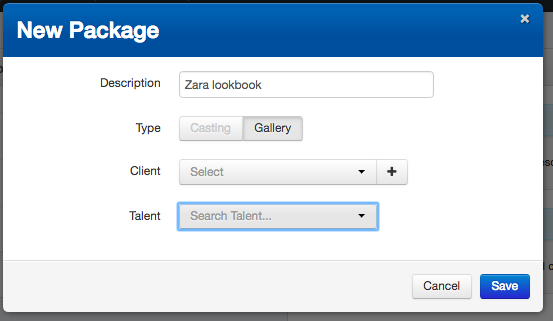 You are also able to populate your package with Talent in this window if you want to (by name only), or you can do this once the package has been created. 5. Once you have filled everything out, click Save.